Double Parlor of the Missouri Governors Mansion, Jefferson City,Mo. Some one recently said that my house reminded them of a French Whore House. Well, I for one have never been in a French Whore House or any Whore House, as far as that goes. I am sure, the Lady, well, woman, well idiot,who called my house a French Whore House, has never been in one either. As close as I have ever gotten to one was in the movies. The Chicken Ranch with Dolly Parton,Best Little Whore House in Texas. Belle's in Gone with the Wind. Remember when Dr. Meade's wife got so excited asking the doctor what it looked like. They had made up the story that they had gone to Belle's Whore House when Scarlet's husband was killed. I can hear her now," does it really have crystal chandeliers and red velvet curtains with a foot long fringe?" Of course they showed it in the movie and I have to admit, I liked it. Especially the big crystal peacock on the table. Well, in that case, maybe my house does look like a French Whore House. "What ever? " As the younger generation says. "What ever?" Campbell house Museum, St. Louis,Mo. One of the most intact homes in America of the Ante Bellum period. If in fact, my house does look like a French Whore House, there must have been a lot of other houses in the 19th century that looked like them also. I fashioned my house after the great homes of the middle to late 1800's in America. I have no pictures of what my house might have looked like. so I did what one would have called an interpretive restoration. I did what I interpreted that the house might have looked like. I did this by studying other restorations of that period. There were several houses that I studied both from books and in person. I chose these houses for several reasons. One, they were of the same age, time period as my house. Two, they had some or all there original furniture and accessories intact. Some of the fabrics and wall paper had been exact reproductions from the originals. Three, They were award winning restorations of that period. The Confederate White House, Richmond, Va.
My house was started in 1845. It had a small addition in 1860. I chose that 1860 period for my house. This is when the builder, Mr. Elgin. lived in the house as a family man and had the most money. Mr. Elgin was a river boat captain, so he had access to Ports of Call, like St.Louis and New Orleans. he had married a lady who had lots of money, land and slaves. So there was no reason he could not have had the things the Elgin/ Cottrell House has today and look like it does today and have so many fine things inside. A.) The Missouri Governors Mansion. Restored and furnished to the 1871 period at a cost of over 11 million dollars. The mansion is one of the best examples of that time. The furniture is mostly not original to the house, but is original to that period. The wall paper and fabrics are also reproductions of the period. This is an award winning restoration. The Missouri Governors Mansion was built as a Governors home and is one of the few in the United States that has been used ever since as a Governors Home. The restoration has been called one of the finest of the period. No cost was spared and the finest examples of furniture was found to fill it's rooms. Experts did research for reproduction wall paper and carpets of the period. It has been called one of the finest Governor mansions in the United States. B.) The Confederate White House in Richmond, Va. It became the White house in 1865. The mansion was built by some one else as a private home. When The Confederate States left the Union and elected there own president they needed a home for him and his family. This house had just been decorated to the latest styles and fashions of the 1865 period by it's original owner. The house and the furniture was sold to the Confederates for one lump sum. The Jefferson Davis family moved in right way. I am sure that Mrs. Davis brought some of her own things and added original touches. When the war was over, the house was made into a museum and nothing was changed. Since then some of the fabrics and wall coverings have been reproduced from the original. But no better example of this period of history could be found anywhere. C.) The Campbell House Museum in St. Louis. The Campbell house was built by another owner also in 1851. The Campbells bought it and moved in around 1854. They lived there for many years. After the parents died it became the home of two of there sons, who never married. After the death of the last son, the house was left to a University. It contained all the original everything inside. Including a lot of photos taken in 1940's. The house was left setting empty by the University for many years.Finally it was put up for sale and all the things inside were for sale as well. A group of St. Louis people got together and bought the house and all the furniture and things inside. It was soon after opened as a museum. It has also won all the awards and was restored at a cost of over 3 million dollars. Wall paper was reproduced as well as fabrics, curtains and carpets. Photos were used to figure out furniture placements. The Cambells were very wealthy people. President and Mrs. Lincoln visited the home as well as other famous people. If ever you want to study a house of this period, this would be a good one. It is one of only a few restored homes with all the original things inside. D,) Melrose Plantation in Natchez, Mississippi. I visited Melrose when I was in college. At that time it was owned by descendants of the original builders. It was built in 1865 and today it is called one of the most intact Ante Bellum estates in the South. Since I last visited the home it has been sold to the State of Mississippi and they have since spent 10 million on it's restoration.All The furniture is original and the fabrics and wall coverings have been reproduced from the original. The house is complete down to the china and silverware, the clothing, papers and inventories of the accessories and slaves. E.) Rosalie, The DAR National Shrine in Natchez, Mississippi. Rosalie was first built around 1823, but was added to and redone in 1953. The DAR ladies have restored the house to that 1853 period. Most of the furniture and accessories are original. Fabrics and wall coverings have been reproduced from originals. Rosalie is one of the grandest homes on the banks of the river ,high on the bluffs in Mississippi. It's colorful interiors have been copied for years and is a fine home to use as a model of that period. Restored at a cost of around 5 million dollars. F.Rattle and Snap Plantation. Mt Pleasant, TN. built in 1860. Rattle and Snap gets it's name from a game of cards. The story goes that the original owner was in a heated card game and bet the plantation. Well he lost and the new owner called it Rattle and Snap. In books about fine American homes and architecture , Rattle and Snap is always featured. It is of grand style and is fully restored today to it's original glory. The new owner recently spent a little over 3 million doing the restoration. 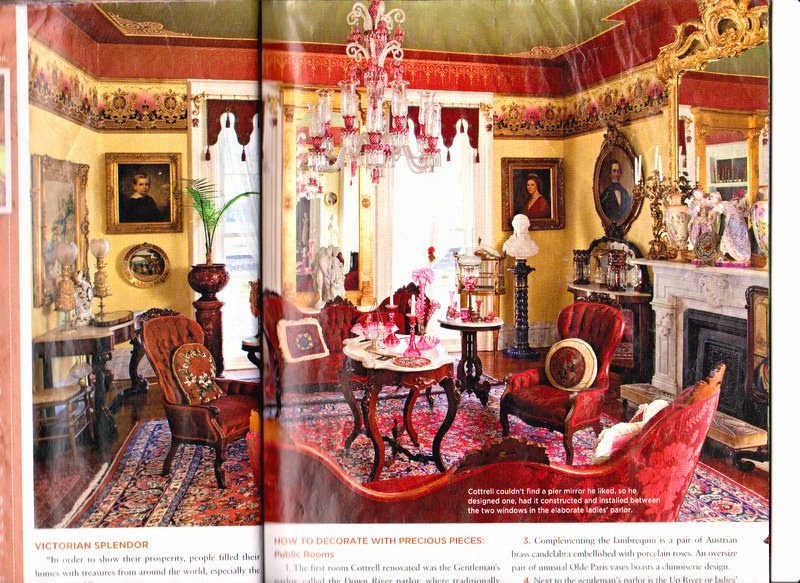 The finest fabrics, trim and wall coverings of the period as well as furniture was purchased for the restoration. Rattle and Snap is a glory to behold. When I set out to restore the Elgin/Cottrell House in 2006, I went and studied all these houses in great detail. Most of them have books for sale so I bought them. I talked to some of the owners and some of the curators. I asked a lot of questions and got a lot of answers. Some of there reproduction wall covers were used in my restoration. I have to say, I had no millions to spend. I had no state government behind me or oil companies. I had to pay for the whole thing all by myself. I spent about 150 thousand and did most of the work myself. I learned to tuck point, plaster, wall paper, paint and marbleize. I did have a dear sister that sews beautifully and she helped with the curtains. I was lucky to have most of the beautiful furniture ,accessories ,rugs ,lamps, paintings and chandeliers. If I had to buy those, the cost would have doubled. 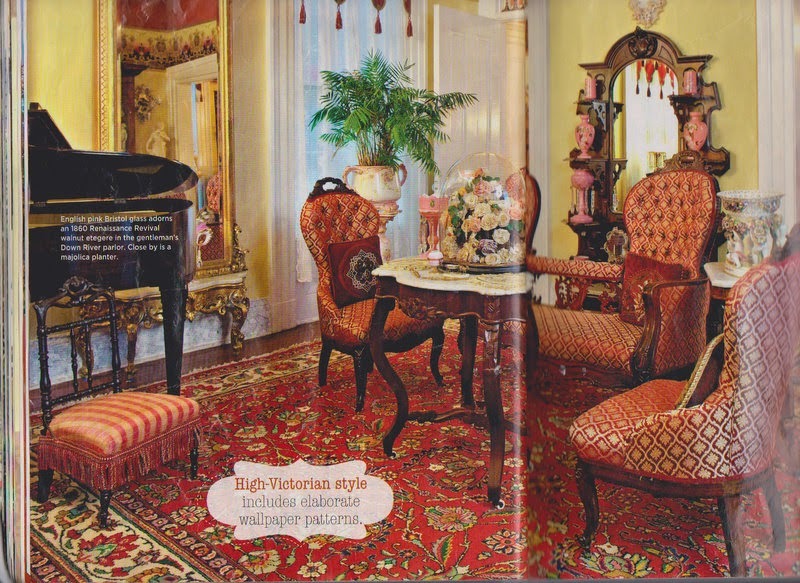 My home was featured three times in the national magazine, Victorian Homes. The editor at the time said my home was one of the best examples of it's period, done by an individual on a minor budget. Maybe it does look like a French Whore House. I don't know that answer. But I do know it looks good compared to the best of that period. Please come by some time for a real tour. I will always leave the lights on and Sissy Dog will meet you with a jump and a kiss. And I can promise you, there are no whores, French or American , here, but if there were, what a grand place to be. My House taken by me today. French Whore House? Great American Ante Bellum Restoration?